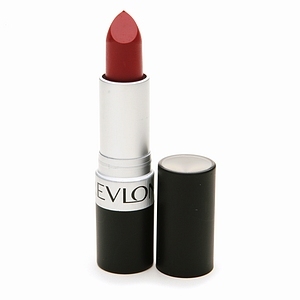 My quest for the perfect lipstick ended when I tried Revlon’s In The Red. It’s a rich red with just a hint of warmth. It looks kind of dark on here but on me it’s brighter. It is taking a little getting used to because I usually wear pretty muted colors – burgundies, reddish-browns, etc. I will be happy to show you how it looks on me when my hormones stop messing around with my skin, because right now, it’s just not pretty, people!